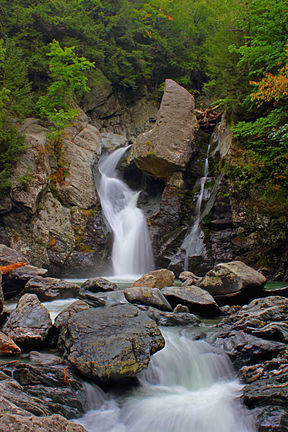 Bash Bish Falls State Park in southwestern Berkshire County is one of many parks in Massachusetts that is supported by the Land and Water Conservation Fund. Environmentalists in Massachusetts are campaigning to make sure federal funding remains intact to preserve the commonwealth’s parks and natural resources. The Land and Water Conservation Fund is celebrating its 50th birthday this year. Field associate Ben Hellerstein and other members of Environment Massachusetts want to make sure there are many more to come. In 2013, Congress allocated just one-third of the Fund’s intended level. Legislation that has made it through the House Appropriations Committee would drop funding to $152 million, just one-sixth of its allowed amount. Since April, Environment Massachusetts has collected more than 20,000 petition signatures urging full funding that Hellerstein says will be delivered to the Bay State’s U.S. Senators, Elizabeth Warren and Ed Markey. The bill Hellerstein mentions is sponsored by Senator Richard Burr, a North Carolina Republican. Markey and Warren, both Democrats, are two of 42 Senate cosponsors. Beyond even the concern of funding levels is the chance that the Land and Water Conservation Fund could no longer exist. Its current mandate is set to run out next year if not continued by an act of Congress. Hellerstein is hopeful. Using revenue from offshore oil and gas drilling on federally owned areas, over its history the Fund has contributed more than $200 million to parks in Massachusetts stretching from the Cape Cod National Seashore and The Boston Common to Bash Bish Falls and the Appalachian Trail, according to Hellerstein. A recent report from Mass Audubon found that between 2005 and 2013, roughly 38,000 acres of forest and natural land was developed. That equals 13 acres a day. With support from the LWCF and other programs, Massachusetts has preserved 41 acres a day during that same period, according to Mass Audubon’s legislative director Karen Heymann. For Hellerstein, preservation is the most important purpose of the Land and Water Conservation Fund. Environmental officials from across Massachusetts were in the Berkshires this week to celebrate a conservation milestone. $1.9 Million Awarded to Protect Land from Development in Western Mass. Governor Deval Patrick’s administration recently awarded nearly $2 million in grants to preserve large tracts of undeveloped land in Western Massachusetts. Last week Massachusetts Executive Office of Energy and Environmental Affairs Secretary Rick Sullivan announced the Landscape Partnership Program is supporting two projects to protect thousands of acres of agricultural and wooded land from development in Franklin and Berkshire Counties. July 29th is the date when bikers hit the road and help save farmland. Tour de Farm, now in its third year, is a recreational bicycle ride organized by ASA and Saratoga P.L.A.N. in partnership with Saratoga National Historical Park. Teri Ptacek - Executive Director of the Agricultural Stewardship Association and Maria Trabka, director of Saratoga P.L.A.N. join us to tell us more. A city park seriously damaged by the June 1, 2011 tornado that hit Springfield reopened today after a nearly $1 million improvement project. City and state officials joined with residents of the Sixteen Acres neighborhood to praise the Camp Wilder Park renovations. Mayor Domenic Sarno said the park is an “urban oasis” in an area that had been ripped to shreds three years ago by the tornado.
" I almost had a tear in my eye coming in here today. To think of all the debris that was here and now look at this magnificent park. But, we always had a can-do attitude." This week Massachusetts’ Executive Office of Energy and Environmental Affairs and its agencies released a new set of guidelines that promise to manage water consumption to maintain and conserve healthy rivers and streams.